A criminal gang involved in land trafficking has tortured and murdered a community leader in northern Peru, according to his wife and local villagers who witnessed the killing. José Napoleón Tarrillo Astonitas, 50, was attacked by four men in his home on Saturday night. His wife, Flor Vallejos, told police he was bound by his hands and feet, beaten with a stick and strangled with an electric cable. As she was covered in a blanket and forced to listen to her husband’s screams, the attackers told him they had been paid to kill him, Vallejos told a national radio station. A local police chief said a murder investigation had been opened and the killers were being hunted. A community leader in El Mirador village, Tarrillo, known as Napo, opposed land traffickers who had taken over parts of the Chaparrí Ecological Reserve and were clearing land and sowing crops. The reserve is a wildlife hotspot, with one of the largest populations of the rare spectacled bear in South America. Vallejos said her husband had received death threats from people within his community for opposing deforestation and land invasions in the private reserve. “He was threatened two days before he was killed,” says Juan Carrasco, a fellow member of the Muchik Santa Catalina de Chongoyape farming community, in Peru’s northern Lambayeque region. “This was to be expected,” Ana Juarez, a biologist working in the area, told the Guardian. Juarez claims the murderers are known to the community and were responsible for the brutal killing of three farmers in October 2016 in reprisal for the eviction of land traffickers from the nearby San Francisco de Salas community. 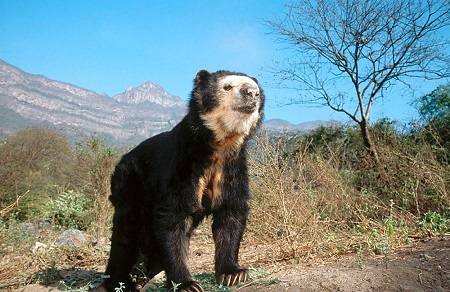 Famous for its spectacled bears, the inspiration for the fictional Paddington Bear, the Chaparrí reserve receives visitors from all over the world. It is considered a model for community ecotourism and generates income for the local people. The reserve is also home to the critically endangered white-winged guan, a bird once thought extinct. North-west Peru is considered a hotspot for endemic bird species. Heinz Plenge, a renowned Peruvian wildlife photographer and one of the founders of the private reserve, says the criminals operate with “absolute impunity” and that land traffickers have infiltrated the peasant community which owns the communal land on which the reserve is situated. The announcement of an irrigation project for the Lambayeque region in 2012, which would place two reservoirs in the Chaparrí reserve, sent land prices skyrocketing, Plenge explains. The project is on hold, but some land prices have risen from $80 to $10,000 per hectare, he says. Javier Ruiz Gutierrez, founder of the Save Chaparrí Defence Front, said the land traffickers are “trying to terrorise the population” so they can clear land for the proposed reservoir, which could transform the reserve into prime agricultural land. “The absence of an effective government response to environmental crimes exposes local conservationists to intense social pressures, violence, and death threats, which are often carried through,” said Noga Shanee, a local conservationist and founder of the Neotropical Primate Conservation NGO. “In this case, like in many others, reports were filed to all the relevant authorities about forest destruction and death threats, but were repeatedly ignored,” she adds. The Guardian has contacted Peru’s national parks authority for comment. Photo: The Chaparrí Reserve is a wildlife hotspot, particularly known for its population of the rare spectacled bear (Tremarctos ornatus). Source: Robert Harding.